In the Cincinnati Opera’s production of As One, a chamber work by composer Laura Kaminsky and librettists Mark Campbell and Kimberly Reed, theatrical and musical magic are made within the span of ninety minutes. A first-tier string quartet led by Gene Chang provided the instrumental portion. The story of Hannah, formerly a male and now transgender, is told in a series of vignettes tracing her journey from a young boy, through college to early adulthood. There is no plot in the conventional sense, but instead a strong narrative that reveals Hannah’s innermost thoughts and emotions. Matthew Worth, an impressive singing actor with a rich baritone, played Hannah Before (i.e., before her transition), and Amber Frasquelle, a superb mezzo-soprano, played Hannah After. Both are gifted young singers with acting chops that held the audience riveted, as they told the story of a transgender person in the process of first finding — and then reinventing — whatever is left of the outward trappings of her former self. Admittedly not a subject matter familiar or perhaps even not palatable to some of the opera-going public, As One was inspired by the real-life story of librettist Kimberly Reed, who created the film used in the production. The creative team handled the material sensitively and intelligently. Along with Reed, director Robin Guarino, costume designer Rebecca Senske, lighting designer Thomas C. Hase, and wig and makeup designer James Geier, all helped craft a straightforward and elegant production. 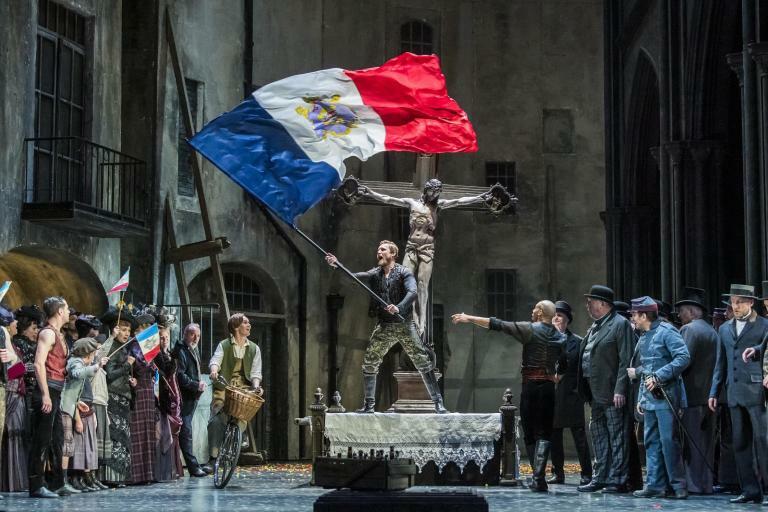 Operas of this theatrical and musical quality are injecting new blood into a centuries-old repertory — not to supplant it but to infuse it with a 21st-century sensibility that rings bells of recognition for an audience that the opera world is hoping to attract. With Kaminsky’s inventive score serving the text 100% of the time, and Campbell and Reed’s libretto in full partnership with her, As One is a welcome breath of fresh air.